Asheville Gallery of Art will feature the work of Judy Rentner during the month of October. Her show, titled “Fall Light,” will feature Rentner’s landscapes in oil using the palette knife. Her paintings are saturated with color and texture. “This exhibit reflects my excitement in painting the beauty of North Carolina, and I hope, through these creations, one can glimpse the Creator Himself,” she says. The artist claims she had an insightful leap a few years ago that gave her a new perspective, a new way of seeing and doing things. “I began experimenting with the palette knife in my landscape paintings, and discovered it gave me a freedom of expression that was more spontaneous and passionate. It allowed for a purity of color, as well as more depth and contrast than I could ever achieve with a brush,” she says. Rentner has lived in Western North Carolina for 16 years. She has painted in watercolors, acrylics, and oils, and has given workshops and demos in all those media. Over the years she has been an active member in several art organizations and has exhibited her work in shows and galleries. 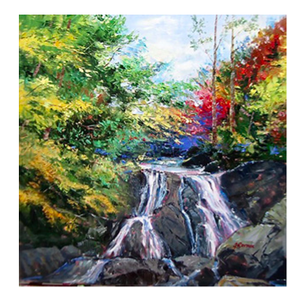 Currently, the artist is a member of the Asheville Gallery of Art and also shows her work at the Twigs & Leaves Art Gallery in Waynesville, NC. The show will run October 1 to 31. The public is invited to the opening reception on October 2, 5 to 8 p.m., where they can view Rentner’s work as well as the works of the 27 other gallery artists.